Elastocoast® is a novel, intelligent polyurethane system. It is a two-component binder for revetments in coastal areas and stabilization of river banks. It is so open-pored that it deprives wave run-up of its destructive energy, thus demonstrating its strength to make shorelines and river beds substantially saver. Experts predict that the sea level may rise by up to 50 centimeters in the coming years as a result of global warming. Of course, no scientist can foresee when and how this rise will actually occur – or the ultimate consequences. But it does highlight the obvious need to intensify coastal protection and flood prevention activities and particularly to raise the dikes. However, in view of the financial investment involved and for practical reasons such as lack of space, raising the dikes is rarely or not at all feasible. Another dangerous scenario is dike overtopping, since subsequent erosion on the land side inevitably results in complete dike failure. This is where Elastocoast® opens up a totally new dimension in coastal protection. Revetments of Elastocoast® are a new, extremely effective coastal protection system. They consist of aggregate (crushed rock) mechanically bonded with an environmentally compatible 2-component polyurethane plastic. This mixture is applied to previously prepared dikes, walls, breakwaters and other sea- and freshwater shorelines. The outcome is a highly durable, strong and hence secure bulwark against the waves and flooding. Elastocoast® makes existing dikes safer without their having to be continually raised. Instead, an open-pored wearing course prevents wave impact energy from attacking and destroying their surface. The surface protected with Elastocoast® creates a higher standard of safety by significantly reducing wave run-up with its open, energy-absorbing structure. The wave energy is distributed over a larger area, thus diminishing local concentrations of surface pressure. The revetment as a whole is subjected to less stressing. This way, older dikes can be made safer, even when they are completely overtopped. On a sealed surface, water masses will turn into a wave without being slowed down and eventually break with their full destroying power and will be reflected. If water masses run on a porous surface, part of the hydraulic energy will be absorbed by friction in the volume of pores and eventually transformed into thermal energy. The water masses will reach a lower wave run-up with lower hydraulic energy and reduced damage potential as a result of this. And even if higher standards of coastal protection are called for as a result of long-term climate change and rising sea levels. The PU system can be used for trouble-free repairs to older dikes, as Elastocoast® can be applied straight onto the existing revetment – without elaborate pretreatment and with much less manpower. What has already proven successful in coastal protection can also be used on river banks and canals. The goal here is also to create a strong and near-natural revetment to consolidate shore zones and stabilize them against traffic-induced waves and – as in the case of the Elbe River – against the tides. 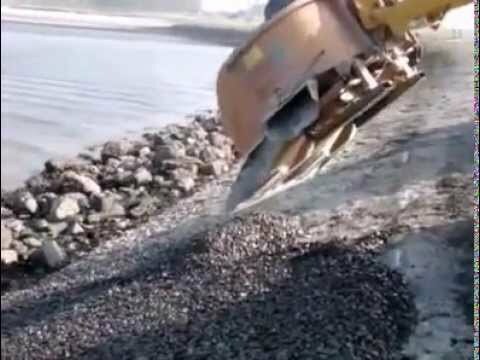 In waterway engineering, there is also the possibility of underwater installation where the rock-PU mix, after sufficient reaction time, is poured into the water close to the bank and compacted. The principle is just as simple as for dike construction and protects the banks from disintegration and damage due to strong currents. The stones used have to be clean and surface-dry before being processed. This is a requirement that seems to be difficult at first sight. As other realized projects show, certain simple measures regarding handling and logistics eliminate this obstacle. Elastocoast® consists of approx. 50% of vegetable fatty acid esters, thus renewable raw materials. In addition, due to the high porosity cavities it provides additional habitat for animals and plants. Also the Elastocoast® revetments easily integrate into the overall appearance of the landscape. Due to the transparency of the material, it is difficult to set them apart from naturally coloured rip-rap. Before the material has completely cured, the surface should be covered with dry sand by which the visual effect is additionally adjusted and a skid resistant surface can be created. Placing Elastocoast® coated stones. Avoiding undercutting with geotextiles. Step 5: Placing Elastocoast® coated stones. Avoiding undercutting with geotextiles. Thanks to Elastocoast®’s extremely open-pored structure and high mechanical strength, revetment courses can be designed up to 50 percent thinner. Revetments grouted with bitumen or concrete require crushed rock 200 to 300 mm in size. Elastocoast®, on the other hand, makes use of aggregates of smaller sizes (20 to 60 mm). This quickly yields considerable savings in the cost of construction materials, transport and processing. The overall benefit is of the order of 20 to 30 percent. Ultimately, using Elastocoast® thus not only improves safety, but also makes installation schedules more flexible and significantly eases the strain on the coastal defense and flood prevention budget. But there’s another advantage to the revetment’s extremely porous nature. During flooding, storms and heavy rain, the dykes normally become waterlogged with a dangerous build-up of pressure. When water levels then fall, this pressure has to be released as quickly as possible. Here again, the open-pored Elastocoast® rock mixture proves to be vastly superior to other systems and techniques. Biological studies by the University of Amsterdam have shown that revetments with Elastocoast® are colonized by the flora and fauna typical of the local region within just a few weeks. Unlike conventional, impervious coastal defense structures, Elastocoast® revetments with their cavities also provide additional habitats for the animal and plant world. And thanks to the transparency of the material, the revetment blends noticeably better into the local landscape. To demonstrate the environmental impact and ecological benefits of new Elastocoast® technology, an extensive eco-efficiency analysis has been carried out. This involved a life-cycle analysis of various products and processes in terms of their impact on the environment. The ecological assessment is based on DIN EN ISO 14040 and 14044 and has been certified by TÜV (Technical Control Board) Berlin as an overall method. Elastocoast® was compared to traditional coastal protection methods such as concrete and open stone asphalt (OSA) on a surface area of 20,000 m². 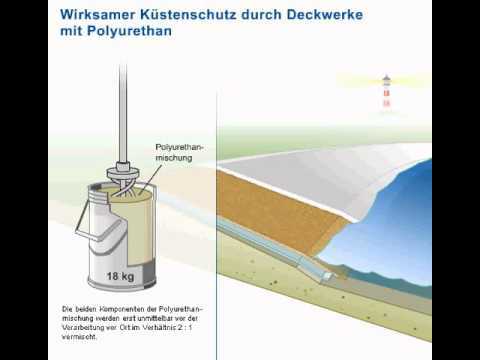 The most recent study (in 2014) of the Institute of Environmental Hygiene and Toxicology in Gelsenkirchen, Germany, has confirmed the safety of the PU system in coastal protection in terms of toxicology and environmental medicine. Long-term monitoring and controls of stability, erosion resistance, recolonization, resistance to weathering and saltwater, and many other parameters have shown that Elastocoast® revetments already achieve top results on the decisive counts. Hydraulic engineering structures are expected to have a life time of 20 years and more. All construction materials on inorganic (cement-bonded) or organic (plastics) basis are subject to the impact of weathering when used outdoor. Particularly damage caused by ultraviolet radiation, salt water and frost must be considered. PU materials are established in outdoor applications such as concrete and sports ground coating or offshore, oil and gas pipelines resisting salt water attack. The degradation process that takes place in sea water was accelerated by increasing the temperature in small steps up to 80²C. In this way the results can be extrapolated back to 20-30°C. This extrapolation shows that the PU-material is fully stable in salt or sea water at service temperature of 20 - 30°C and it has a lifetime expectation of 80-100 years. The TUHH provided evidence that there is a sufficient persistence when exposed to UV irradiation, tested in special developed water transition area equipment. The frost resistance is secured by tests in accordance with DIN EN 13383-2. Abrasion tests show that Elastocoast® is much more resistant to erosion and abrasion than Open Stone Asphalt. The TU Delft got these results by using the equipment in which test specimen were exposed to an erosion load consisting of coarse gravel and water in a barrel. Mechanical analyses and correlations at the TUHH showed that maximum loads of a wave height of 8 m and a flow rate of 10 m/s were achieved. This proves that the physical properties of PU revetments are as a minimum comparable to those of conventional reinforced revetments and thus fulfill the necessary requirements. The performance of open stone asphalt revetments can be calculated using the GOLFCLAP mathematical simulation developed at TU Delft, based on the expected wave height and the associated wave impact load. By recording, among other things, frequency-dependent mechanical data for Elastocoast®, it was possible to apply the Golfklap simulation to Elastocoast® revetments. This makes a calculation method available that marks a significant contribution toward reliably dimensioning the construction of PU revetments with regard to the expected hydraulic load. The calculations have shown that under equal hydraulic stress, Elastocoast® revetments enable the layer thickness used in the revetment to be reduced by up to 50%, thus producing substantial savings in building costs. TU Delft has also applied the same dimensioning process to the Sylt Hindenburgdamm project (Morsum-Keitum). 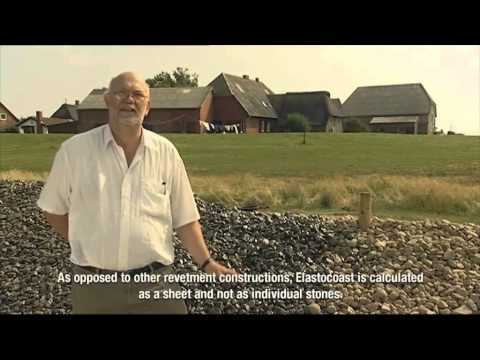 Here it was shown that an Elastocoast® revetment with a thickness of 15 cm can theoretically withstand waves of up to 5.2 m in height, as compared to a maximum wave height of 2 m for open stone asphalt revetments. Overtopping a dike by water masses with high flow speeds is one of the most dangerous scenarios as this can cause landside erosion and a total failure of the dike. At the moment hydraulic engineers are discussing how to protect dike surfaces on the land side from erosion by overtopping. Rijkswaterstaat executed a test with an overtopping simulator on an Elastocoast® revetment as well as on other constructions like grass and Open Stone Asphalt. In three series of tests the simulator released 30, 75 and 125 liters per meter per second impacting the Elastocoast® revetment over six hours each. Even at the highest flow rates ever tested of 125 l/m*s, no single damage was monitored and the Elastocoast® revetment was analyzed as the most stable construction. In order to provide the proof of steadiness and erosion resistance of Elastocoast® revetments, laser surface scans were applied on the pilot project Hamburger Hallig (approx. 120 m², built in October 2004) by TUHH and analyzed comparatively. The difference between those scans analyzed possible changes of the revetment concerning lift, subsidence or other superficial erosions. However, the scan results illustrated that no substantial changes have occurred which means the steadiness of this Elastocoast® revetment is validated. Two pilot sites were installed in the Netherlands at Oosterschelde-Zuidbout and Petten with layers of 10,20 and 30 cm each. Detailed data provided by wind and wave observations in the Oosterschelde are the base of the correlation with the stability of the Elastocoast® revetments. - Microscopic damages of the Zuidbout and Petten Elastocoast revetments are negligible. - There are only superficial abrasions. - Even the 10 cm layers performed as stable construction.